Prehistoric Pottery Orkney research by Andrew Appleby | Harray Potter Ltd.
Orkney Prehistoric Pottery Research Associates (OPPRA) was formed in 2007 by potter Andrew Appleby and archaeologist Stephen Harrison with the aim of undertaking experimental research into the making of prehistoric pottery. The project, which is based at Fursbreck Pottery, Harray, Orkney, is an active collaboration between archaeologists and potters, with substantial community involvement, and aims to come to some understanding of the processes involved in the manufacture and firing of prehistoric ceramics and their use during the third and early second millennia BC within a specifically Orcadian context. To date (November 2008) the research has focused on the making of Later Neolithic Grooved Ware, the type of pottery associated with, for example, the well known villages of Skara Brae and Barnhouse. 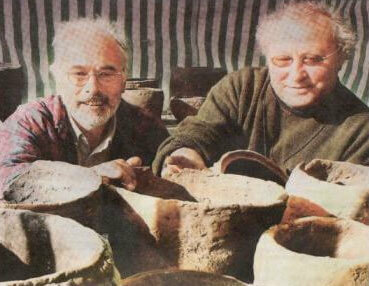 Over 400 pots have been made and four firings have taken place, with more planned for 2009. The data from this work is shedding important new light on the production of Grooved Ware, and, when fully published, will create a body of experience that will be of use in the interpretation of this type of pottery from the regional archaeological record. All aspects of the project are being fully documented. Anyone requiring further details about aspects of the work is invited to contact Andrew Appleby or Stephen Harrison.